This month we’re taking some time to thank our dental hygienists, and with good reason. Every October is recognized at National Dental Hygiene Month. It’s 31 days dedicated to not only recognizing the important role dental hygienists have at our dental office in Plainsboro, but also to educate patients on just what our hygiene team does during their appointments. 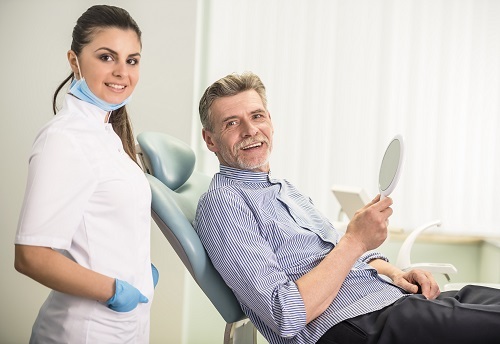 When you visit your dentist in Plainsboro, you will most likely have some time with a dental hygienist. Besides preventing any dental problems from popping up, this hygienist is also responsible for passing along information on how you can keep your teeth healthy in between visits. Some of the most helpful tips are below. Many times mouthwash is used as a breath freshener, but if you’re using the wrong mouthwash for you it can actually make bad breath worse. If you choose to use mouthwash, choose one with the ADA Seal of Acceptance or talk with your hygienist about what's right for you. This October, and at every visit, we hope that you will thank your dental hygienist for doing their part in keeping your smile healthy. If it’s been longer than six months since your last dental cleaning, we welcome you to call our Plainsboro dental office to schedule an appointment today.